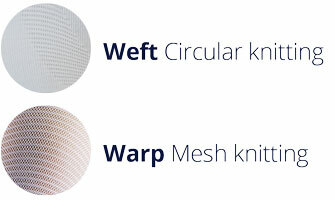 Our technology platform is centered around weft (circular) and warp (mesh) knitting technologies. Your benefits? Seamless, body-fitted medical fixation and compression healthcare textiles. Seamless bodyfitted garments with targeted and controlled support and compression. Circular knitting allows for 100% seamless knitting in critical areas of the body, e.g. after surgery, which means faster healing, less scarring and higher patient comfort. Medical mesh knitted garments with targeted and controlled fixation of body-worn devices. Strong know-how and technology in the weft (circular knitting) and warp (mesh knitting) techniques, combined with many years of hands-on experience, make us capable of delivering medical textiles and garment solutions that will provide "benefits around the body". That means that all the medical textiles and garments produced with the weft (circular knitting) and warp (mesh knitting) techniques benefit the specific medical condition it is intended for. Tytex masters all diameters that fit the human body and the output is finished or semi-finished body-fitted products, roll-goods or fabrics. Tytex is an OEM and private label manufacturer to some of the largest medical brands on the global market: We know what your business is all about.